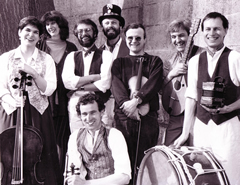 2013 was the band's 20th anniversary: we released our first album 'The Oxford Ramble' - the brainchild of folk entrepreneur and all round good egg Tim Healey - in April 1993, and played our first ever gig on 3rd May. The centrepiece for our celebrations was a 20th anniversary concert at the Holywell Music Room in Oxford on May Eve where we were joined by former band members and a number of really special guests, including John Spiers, Benji Kirkpatrick, Paul Sartin, Jackie Oates, Chris Leslie and Hilary James & Simon Mayor. For a selection of photos from the last twenty years, have a look at our Archive. You can watch video footage (unfortunately not of the highest quality) from our very first concert on YouTube.